A guide to primary source documents and important reference materials in the collections of 22 member libraries and archives. Browse the individual holdings, or conduct a keyword search. A report on hundreds of Civil War sites and programs in Philadelphia, as well as a database and downloadable dataset of more than 400 past and present Civil War sites in Philadelphia. The database is searchable by theme. The database is a collaborative project of the Civil War History Consortium, the Philadelphia Area Consortium of Special Collections Libraries, and the Athenaeum of Philadelphia. 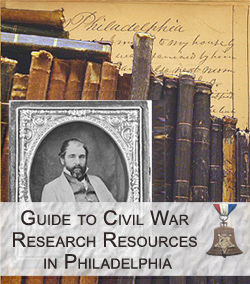 Google Search of CivilWarPhilly partner websites. Based on the charter members of the Civil War History Consortium.